I am trying something new this year with my botanical art drawings. Fine Art Ceramic Tiles. This is the latest in the experiment ~ Tulipa "Apricot Parrot" and bulb. The image becomes part of the tile by a heat transfer process. It comes with a D-ring attached to the back, ready for hanging or, if you wish, may be displayed on an easel. The tile measures 6" x 8". 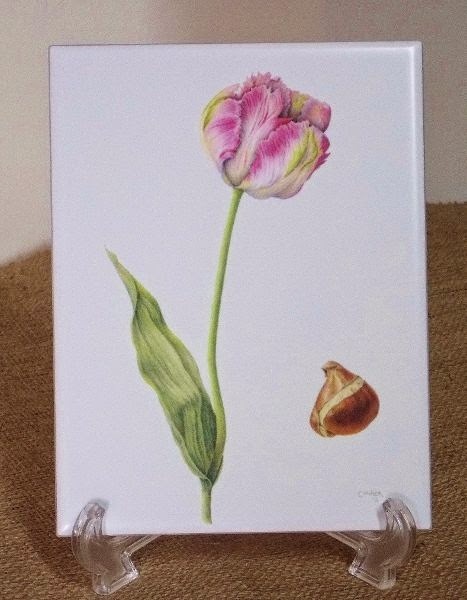 The tulip joins 2 others in the series ~ a pine cone and hydrangea on 4" x 4" tiles. These come with a cork backing and may be used as coasters or displayed as a work of art.